The photo studio can be found right at the heart of the CBeebies Land at the base of the giant treehouse the Cbeebies Bugs call home. 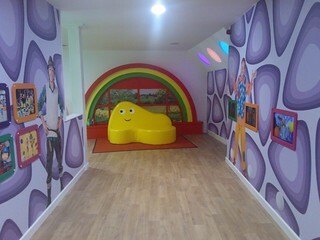 You can ring the doorbell and see if anyone's home but guests are always welcome in the CBeebies Land Photo Studio. Step inside the studio, and you'll find yourself transported into the set of CBeebies, where you can take a seat on the CBeebies sofa whilst you wait for your turn in front of the camera. But the experience doesn't end in the CBeebies studio, but soon the wonders of technology will transport you into any one of a number of CBeebies shows and have your photo taken with all your favourite characters you find within. The CBeebies Land Photo Studio took over the tree that had formerly been Peter Rabbit's house in 2014. When Storybook Land first opened in 1995, the tree acted as the entrance to Peter Rabbit and Friends on Ice. The tree was also home to Ginger and Pickles, a shop where you could stock up on Beatrix Potter gifts. At the back of the shop was Peter Rabbit's living room, where young guests could have their photo taken with the storybook character. In later years the shop was knocked through and became the the main entrance to the Ice Show Arena instead offering confectionery and drinks to customers as they entered the show. With the closure of the Ice Arena at the end of 2005 the shop also closed it's doors and remained shuttered for the following eight seasons. For the last few seasons of Storybook Land, Peter Rabbit's house once again became home to one of the park's entertainment offerings, as Squirrel Nutty's Storytime took place in the area. The new show took place alongside Peter Rabbit's house in the area that had once acted a the entrance to the Ice Arena, and thus the shop itself continued to be shuttered right through to the opening of CBeebies Land in 2014.